VLADIVOSTOK (Interfax) — Freight Group FESCO, a subsidiary of Far East Shipping Co has launched a weekly container train from BLTK’s terminal in Krasnoyarsk to Chengdu in China’s Sichuan Province and Xian in Shaanxi Province via Kazakhstan. Last February, FESCO began a similar route, dispatching its first export block train from Krasnoyarsk (terminal BLTK) to Chengdu (Sichuan Province) through Mongolia, thus expanding the geographical reach of inland services operated on route between Russia and China. FESCO’s own platforms and containers are used to transport goods on this route. The service is focused primarily on Chinese trading companies and the transportation of medium and large lots of goods. Further shipments will be regular with the possibility to deliver cargoes not only to Sichuan, but also to other Chinese provinces. FESCO also plans to expand the scope of transported goods and to attract food and high-value products to it. The first train with 61 containers arrived at the destination on February 20; the train crossed the Chinese border on February 15. Transit time is 10 days, including four days through Russia and Mongolia. The route passes through the Naushki / Zamyn-Uud / Erlyan border crossings. This is the first FESCO’s inland export service to China. FESCO began its operations on inland China-Russia corridor in late 2016, launching the Tianjin-Moscow train. In early August 2017, transit service from China to Germany through Mongolia was launched. The regular train Xiamen-Moscow is also available for clients. In addition, the delivery of goods between China and Russia is traditionally carried out within the intermodal chain passing through the port of Vladivostok. FESCO Transportation Group is the largest intermodal transport operator in Russia, which provides services, including marine shipping, rail transportation and port handling via more than 70 sales offices located around the world. 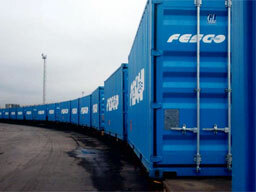 The base company of FESCO Group is FESCO Shipping Company. FESCO Group is headquartered in Moscow.